Translators Uilleam Blacker and Iryna Shuvalova are en garde to fight a poetry translation duel at Ledbury Festival 2018. Uilleam and Iryna discuss their different translations of a single poem by contemporary Ukrainian poet Kateryna Kalytko, who will appear at the Festival as part of Versopolis. Compare and contrast the two translators’ approaches to a striking and powerful poem by one of Ukraine’s strongest and most singular poets reflected and refracted in the English of two highly-skilled translators. Hear Uilleam and Iryna cross swords, and join in the conversation: what makes a translation ‘work’ as English-language poetry? This event is in partnership with Modern Poetry in Translation and supported by the Stephen Spender Trust. Iryna Shuvalova is a Ukrainian poet, translator and scholar. 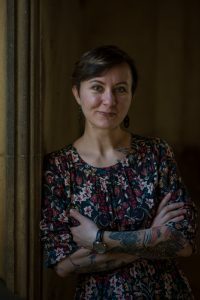 Born in Kyiv, Ukraine, in 1986, she published three collections of poems in Ukrainian: ‘Ran’ (2011), ‘Os’ (2014) and ‘Az’ (2014), and undertook a number of writing residencies in different parts of Europe: among them, the Hawthornden Fellowship in 2015. In 2009, she co-edited ‘120 pages of Sodom’ – the first queer anthology in Ukraine. She went on to win a number of writing and translation awards, including the Joseph Brodsky / Stephen Spender Prize in 2012. Currently, she is a PhD student and Gates scholar at the University of Cambridge where her research centres on the role of oral poetry in war-affected communities. Her first collection of poems in English translation is due in 2019 with Lost Horse Press in the United States. Uilleam Blacker teaches comparative culture of eastern Europe at the School of Slavonic and East European Studies, University College London. 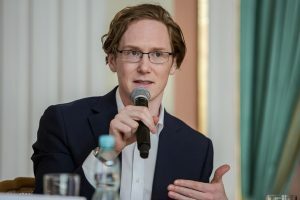 His translations of the works of contemporary Ukrainian writers have appeared in Words Without Borders, Modern Poetry in Translation, Dalkey Archive’s Best European Fiction series and elsewhere. He has published fiction in the Edinburgh Review and Stand and is a member of the Ukrainian-British theatre group Molodyi Teatr London.